Keep your family safe with your decking! The popularity of decking as an exterior surface around your home and other buildings is growing year by year. The look of a timber surface provides a natural charm that appeals to a lot of us, providing a sustainable option in the light of ever increasing environmental awareness. But there is one big problem with timber decking…when it becomes wet it can get lethal. Believe me I know! After a downpour (and the British weather continues to offer its fair share of those), stepping out onto your decking can leave you looking for the handrail whenever you feel your feet sliding from under you. This is far from the best thing that can happen to anybody, especially for children who like to play guns in your garden. · Whereabouts are you going to put the decking? · Who will be fitting the decking? · Will there be steps? · How are you going to use the decking? · Is it going to get wet and will you want to use it when it is wet? With all of your information to hand, you may decide that the ideal option for you is Anti slip Decking. This form of decking only used to be available to the large contractors however lots of decking companies have perfected the smaller size! 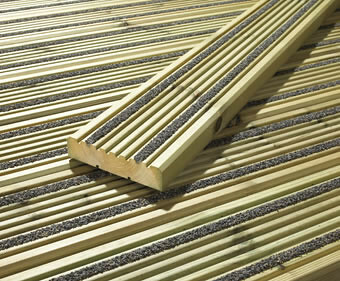 Many people try to make their decking anti slip after the accident but that may be to late. They may decide to try anti slip paints or even purchase some inserts to push into patios. That’s all a lot better than nothing but to be honest it would be better if you start with this particular decking and you could save yourself an trip to the hospital. 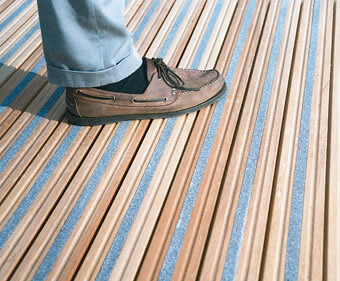 So just what is the difference between normal decking and anti slip decking? Essentially it’s just your normal decking but with additional grooves within it. And then it has been packed with this weird special material that is aggregate and resin (grit and glue if you want) into those grooves. The aggregate is left slightly higher than the surface so that your shoe has something to stop you from crashing to the floor. I’ve actually began to save my money up for this sort of decking. I think its amazing! You are able to use the decking in all types of weathers. Whether you want to I don’t know! I won’t have to constantly drag the kids away from playing on the decking because I know they won’t be hurting themselves. Well whether it actually works will be new to me. So if it doesn’t expect a new article from telling you otherwise.